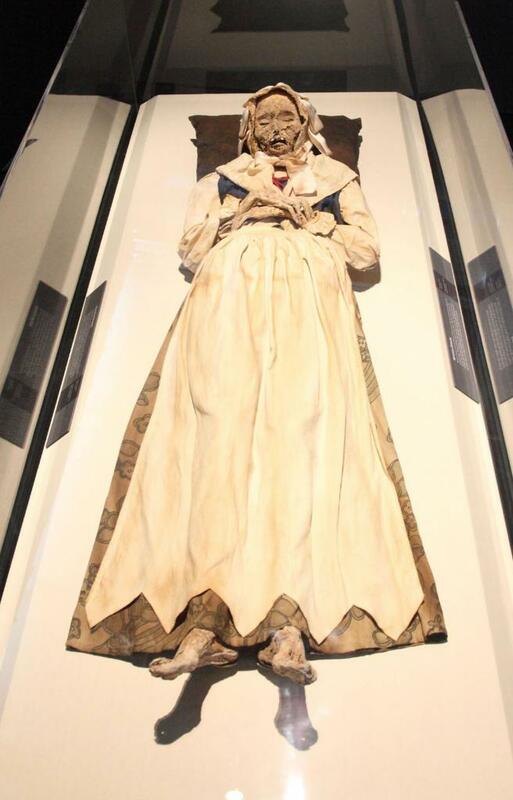 Hungarian mummy featured in Mummies of the World exhibition. One wears a prim white bonnet. Another sticks out its tongue, hands resting over abdomen. A third clutches at its chest, mouth seemingly frozen in a scream. They are faces from the past, just as they were when laid to rest nearly 300 years ago. In 1994 workers discovered a secret crypt that had been bricked up for 200 years in the northern Hungarian town of Vac, inside were 265 hand painted coffins stacked, one on top of the other, in order of size. The occupants were buried between 1731 and 1838 in the crypt of a Dominican church and had naturally mummified, due to environmental conditions within the sealed room. 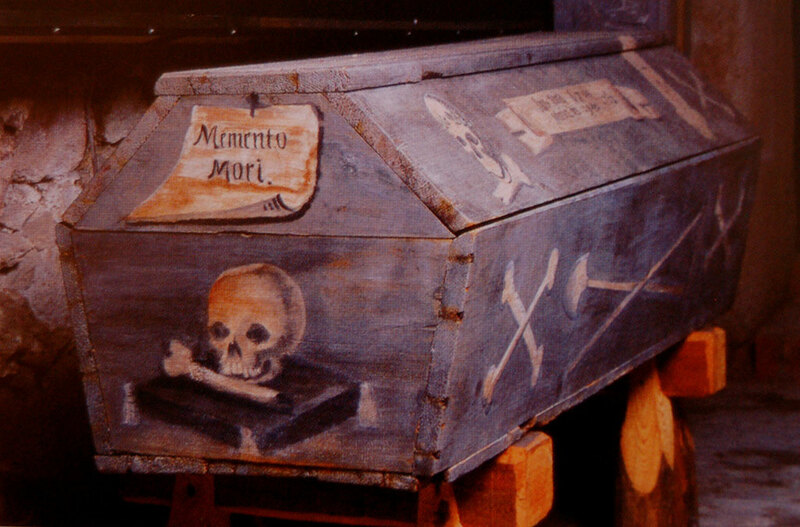 The microclimate inside the crypt, including low temperatures and relatively constant humidity and air pressure and the wood chips placed under the bodies in the coffins, allowed the bodies to gradually dry out – preserving them in an astonishingly lifelike state. Reflecting a wide sample of Vac residents, the mummies include three nuns, 30 priests, the wife and child of the local postmaster, surgeons, the founder of the Vac hospital and first director of the town’s school for the deaf. “What was probably the most exciting and most comprehensive study was the one about tuberculosis,” says Ildiko Pap, head of the Department of Anthropology of the Hungarian Natural History Museum. According to the World Health Organization, nearly 1.5 million people died of tuberculosis in 2010, when 8.8 million new cases were reported. Around one-third of the world’s population, over 2 billion people, has latent tuberculosis, which means they have been infected by the bacteria but do not show symptoms of the illness and cannot transmit the disease. Eighty-nine percent of the mummies, ranging in age from newborns to over 65, had at one point been infected with tuberculosis and around 35 percent were suffering from the disease at the time of death. The strains of tuberculosis found in the people buried in Vac offer a unique chance to study the pathogens from a time before the development of antibiotics. The discovery of penicillin and subsequent development of other antibiotics in the 20th century virtually wiped out diseases such as tuberculosis that were once major killers in developed countries. But the overuse and misuse of drugs have allowed these bacterias to fight back and eventually overpower antibiotics, rendering some useless. She says that the study of the mummies could lead to the development of new tuberculosis medication or the discovery of genetic changes that have affected our reaction to the disease. 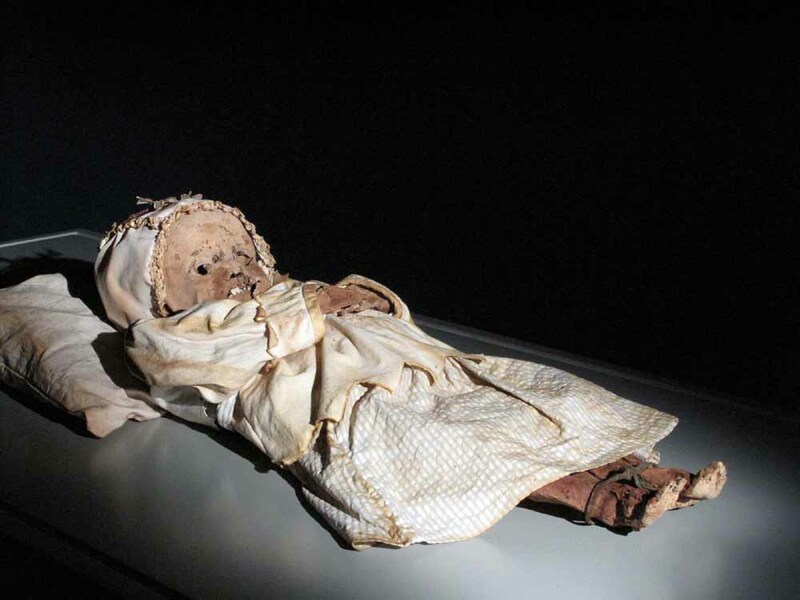 Ruth McNerney, senior lecturer in Pathogen Biology and Diagnostics at the London School of Hygiene and Tropical Medicine, says that the research on the Hungarian mummies could provide a historical reference for the development of the disease. Forensic expert Agnes Kustar has been working on the facial reconstruction of one of the most striking mummies – Baroness Antonia Tauber. To carry out facial reconstruction, experts need a detailed CT scan of the mummy, which gives a 3D picture of the skull. It can then be transformed into a plastic model identical to the original face. This mummy has a special place in the hearts of the team.